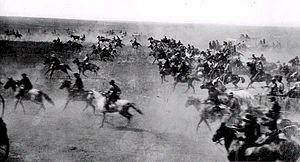 Here is Detroit's version of the Oklahoma Land Rush of 1889. The vacancy rate of apartments in suburban Detroit is very low with rental rates rising. The city has a high vacancy rate of single family homes that are deteriorating and an eyesore, a threat to the safety and viability of neighborhoods, not contributing to the tax base of the city and must be closely monitored thus contributing to the high cost of operating the city. This presents an opportunity for Detroit. The city should offer an abandoned home to anyone who will occupy it as their primary residence for at least 18-months and meet certain requirements. The objective is to grow the population and tax base and alleviate much of the blight in the city. "At twelve o'clock on Monday, April 22d, the resident population of Guthrie was nothing; before sundown it was at least ten thousand. In that time streets had been laid out, town lots staked off, and steps taken toward the formation of a municipal government." In order for Detroit's program to succeed, the new residents must have "skin" in the game including the following. Forgo all other residences not in Detroit within 90 days of occupancy of the Detroit homestead. Occupant must complete agreed to repairs on the Detroit residence according to an agreed to time frame. Must have been employed for at least one year prior to taking possession of the Detroit Residence and meet certain underwriting conditions. Other conditions as deemed appropriate. There is more work needed to launch the program. The city must finalize the rules, set up appropriate procedures and controls to assure compliance with all requirements. Further, the city should add to the staff of the police and fire departments to assure proper servicing of these neighborhoods. The program should be introduced in certain neighborhoods of the city and expanded as experience is gained and demand warrants.